West Ham boss Manuel Pellegrini does not know whether wantaway striker Marko Arnautovic has played his last game for the club. Arnautovic did not travel with the Hammers for last weekend’s defeat at Bournemouth after revealing he wants a big-money move to China. West Ham have turned down an initial bid of £35million from Shanghai SIPG and maintain they do not want to lose their joint top-scorer. Pellegrini wants to keep the Austrian, at least until the summer, but will agree to the sale this month if his price tag is met. Yet despite the speculation, Arnautovic remains at the club and has trained with his team-mates all week. West Ham head to AFC Wimbledon on Saturday in the FA Cup fourth round, but Pellegrini is undecided about whether to include the 29-year-old in the squad. “On Friday, we will see the names of the players in the squad list,” he said. “Marko is working with us without any problems. It is impossible for me to know the future. “Is it a distraction? As a manager, I am worried about many different issues in my squad. “Things happen in football and we know we must try to resolve this as soon as we can. There was a rare piece of good news from the West Ham treatment room on Friday with the news Manuel Lanzini is ahead of schedule in his recovery from a serious knee injury. Lanzini had surgery on his right knee in June after rupturing his anterior cruciate ligament while training with Argentina prior to the World Cup. But just six months later the midfielder has joined up with his team-mates for light training. “Lanzini is working part of the warm-up with the squad but the important thing is that he feels good,” added Pellegrini. Right-back Ryan Fredericks will make his comeback at Kingsmeadow after three months out with a calf injury. But Jack Wilshere, Fabian Balbuena, Andriy Yarmolenko, Winston Reid and Carlos Sanchez are still on the long-term injury list. 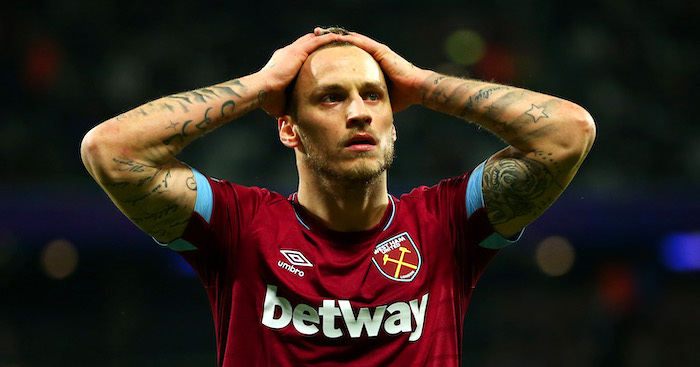 The post Pellegrini provides Arnautovic update ahead of cup clash appeared first on teamtalk.com.